A single oat grain is composed of several parts, including an outer inedible hull, a thinner inside layer called bran and a soft endosperm composed mostly of starches. 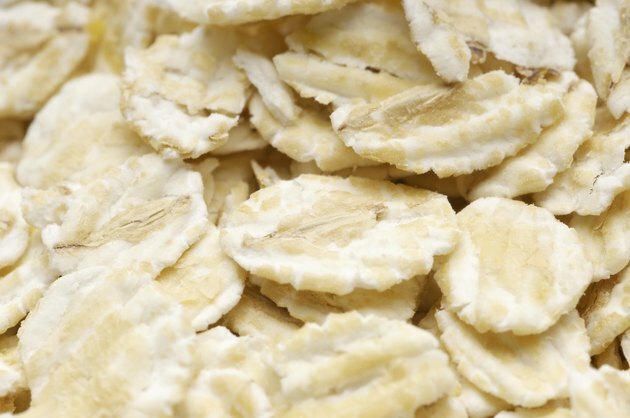 During the processing of rolled oats, most of the bran is removed and processed separately. As parts of the same grain, both oat bran and rolled oats can be cooked as a hot cereal, providing significant amounts of important nutrients. During harvest, whole oat grains are removed from their tough outer hulls. At this stage, they are called groats and have retained the protective inner layer of bran. From there, how they are processed determines their structure, consistency, nutritional value and how long they take to cook. As whole seeds, oat groats take the longest to cook but retain the healthful properties of both the bran and the endosperm. Separated from the groats, the thin bran layer is flaked so it cooks quickly. Oat bran and rolled oats contain comparable amounts of saturated fat, sodium, carbohydrates, protein and sugars, and nutrients such as calcium and iron. Oat bran contains significantly more fiber than rolled oats, providing 58 per cent of an adult's daily requirement in a 1-cup serving. A cup of cooked rolled oats contains 307 calories and 21 percent of an adult's daily protein requirement, while 1 cup of cooked oat bran provides 231 calories and 33 percent of the protein requirement. Oat bran also provides significantly larger amounts of nutrients such as potassium, phosphorus, folate and selenium as well as omega-3 and omega-6 fatty acids. Oat groats take from 45 to 60 minutes to cook, while steel-cut oats take about 30 minutes. Regular rolled oats take about 15 minutes to prepare, but the quick-cooking variety are ready in about five minutes. Instant oatmeal, usually sold in individual packets or single-serve bowls, requires only the addition of boiling water or about two minutes in the microwave. This kind of oat product is usually high in sugar, so not as wholesome as other varieties. Oat bran has no additives and cooks in just five minutes, making it a healthier alternative than instant oatmeal. In spite of their long cooking times, oat groats and steel-cut oats supply all the healthful properties of both rolled oats and oat bran. Alternatives include preparing rolled oats as a breakfast cereal and incorporating oat bran in baking by adding it to muffins and quick breads, which adds nutrients without adversely altering texture or flavor. Or you can switch this up and cook oat bran for breakfast and use rolled oats in cookies or muffins.